Obviously with all these blizzards and dreary weather my thrifting has taken a hit. I don't want to go anywhere for anything, period. I did manage to slip out the other day when the weather decided to be decent (for literally three hours) and get my thrift on. I'm really happy with my finds this week, so all in all the venture was a success. I found a mate to my beautiful embroidered pillow, you may remember it from this post. I've been looking for a match since I bought the first one, so when I laid my eyes on it's square twin I knew it had to be mine. They look glorious on my couch together, yippee! I also picked up a new thermos for my ever growing collection, score! I cant wait until we have a house so I can put them all on display.This cheese tray was also an amazing find, I am a cheese lovahhhh. 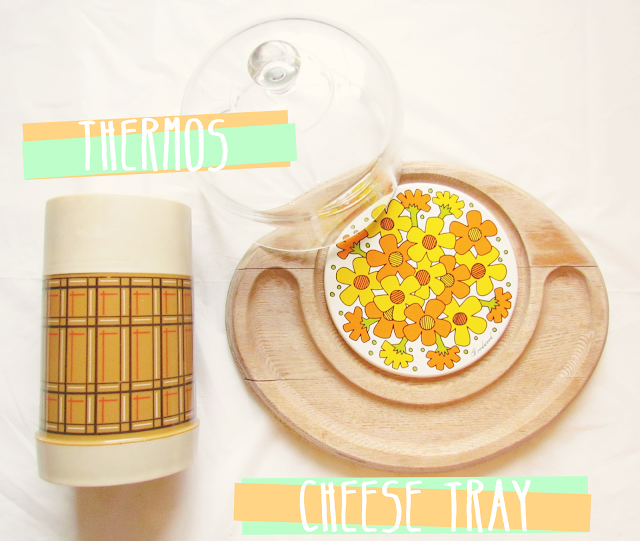 I'm so excited to up-cycle this bad boy and put together the perfect cheese platter for date night with the hubby! Did you find any amazing vintage pieces this week? Thrift any amazing dresses or accessories? Link them up with us and meet fellow thrifters just like you! And don't forget that sponsorships are now open and ready to be filled! Come join the hive today! There is a promo code on the side bar for a little discount on your ad space and I have a lot of exciting things planned for March, you don't want to miss it! Those pillows are so so pretty! LOVE those pillows! I may have to go on a hunt to find one...or 4...of my own! Thew pillows are so pretty and springy. I bet it is helping you think of warmer days ahead. I love those pillows so much!! LOVE LOVE LOVE> SO fresh. I have such affection for needle crafts. Look at how beautiful those pillows are! THOSE PILLOWS! gorgeous! and that thermos is such a cutie. Those pillows are just awesome! They are so colorful, and well I love em. That cheese tray is just so adorable! Great finds!